The trillion dollars company is all out this season, and with what looks like desperation, the tech giant is taking its product service to the next level. I mean, a company who barely focus on services, has just announced four products in an unveiling event held at the Steve Job’s Theater yesterday, March 25. The services which include a Video streaming service, Apple TV Plus; a News channel, Apple News Plus; a gaming Network, Arcade; and lastly a Payment service via Apple Card. Its all good news for the Apple lovers, however, some of the newly unveiled product will require a new software update to function. 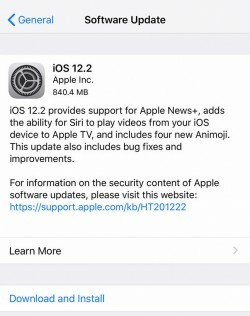 In response, Apple has rolled out a new software update, ‘iOS 12.2’, and it is going to address old bugs, as well as add compatibility for a new product such as the Apple News Plus which is already available in the US and Canada, and is coming soon to the UK and Australia. In addition, iOS 12.2 also introduces four new Animoji – a giraffe, shark, boar, and owl. The newest version of the OS supports Apple’s second-generation Airpod as well. Dedicated TV controls will show up in Control Center and on the lock screen, and AirPlay multitasking lets you browse other apps and play other short-form audio and video files locally on your device without interrupting AirPlay. Moving on, you can now set downtime hours with a different schedule for each day of the week, and a new info field in Settings will tell you how much time remains on your device’s warranty period. Oh, and if you’re on AT&T you’ll see the fake 5G icon starting with this update. so don’t panic when you find another network icon at the edge of your device. Furthermore, Siri can now play videos from your iOS device to your Apple TV. And of course there are the usual “bug fixes and improvements” baked in for good measure. If you are yet to install the iOS 12.2, then you are a bit outdated on that level.